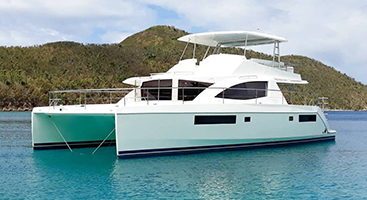 Unbridled, built in 1994 by Crescent Yachts and refit in 2015 is an excellent choice for cruising the Caribbean year round. 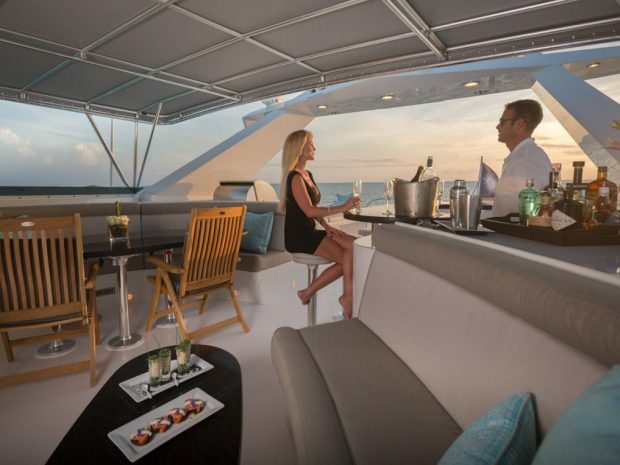 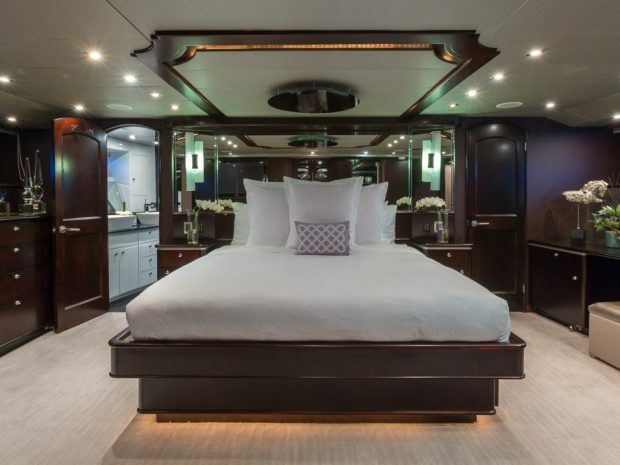 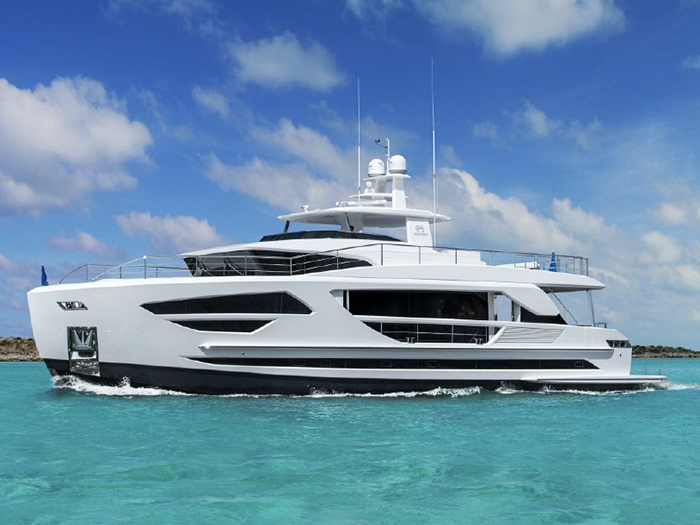 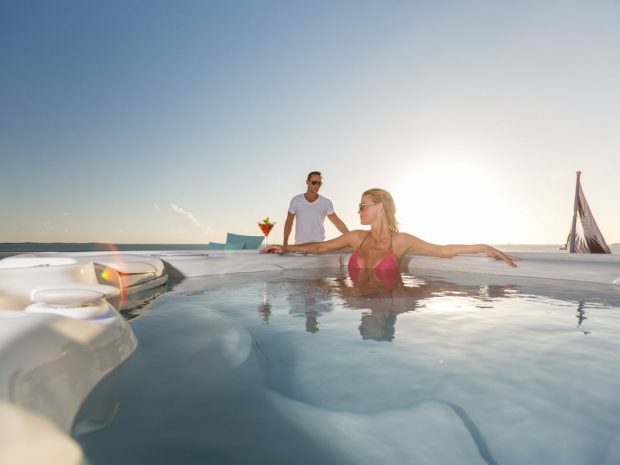 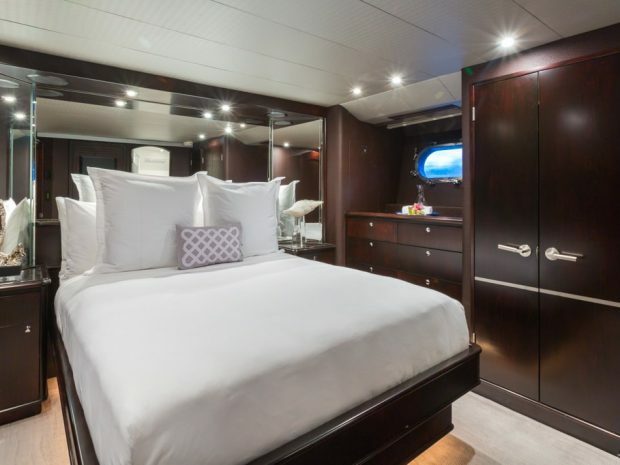 With a contemporary interior and four well-appointed staterooms, Unbridled can accommodate a total of 8 charter guests featuring a massive main salon, formal wet bar, and state-of-the-art entertainment center. 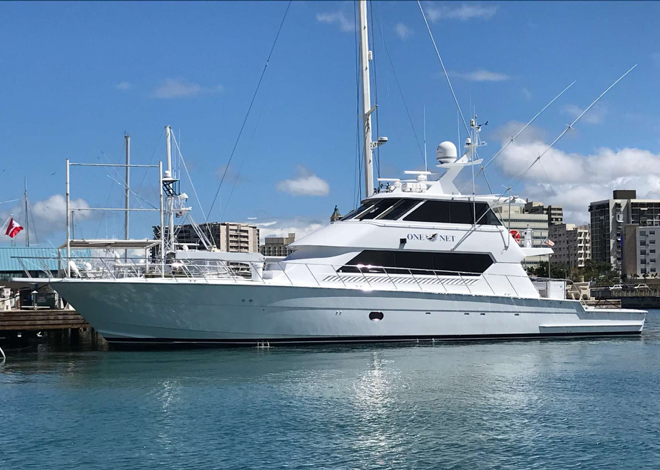 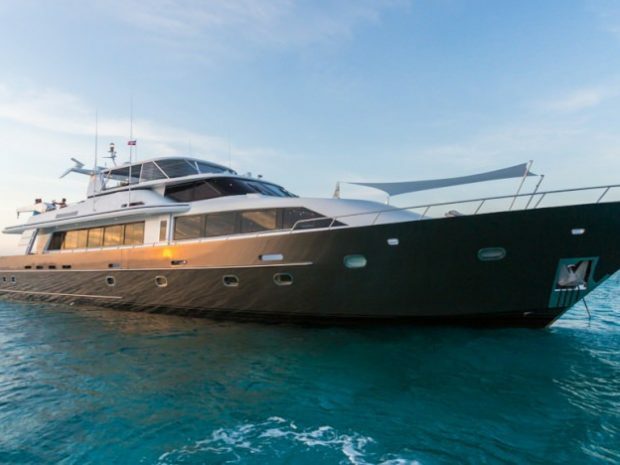 Making her first-ever debut on the charter market, UNBRIDLED is an excellent choice for cruising the Caribbean year round. 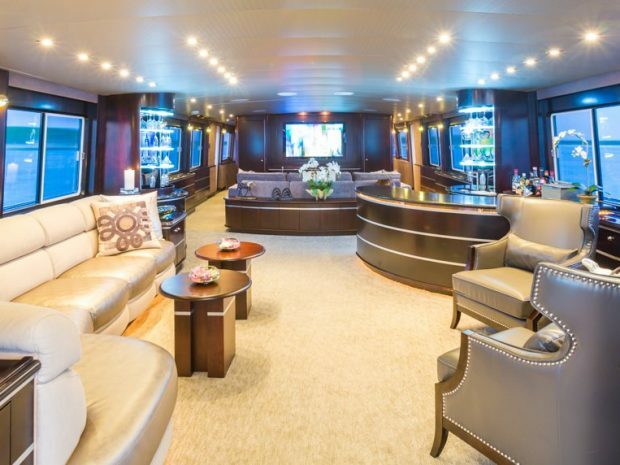 With a contemporary interior, featuring a massive main salon, a formal wet bar, and a state-of-the-art media center with a 60-inch TV and U-shaped couch, guests can enjoy the ultimate lounge and cinema experience. 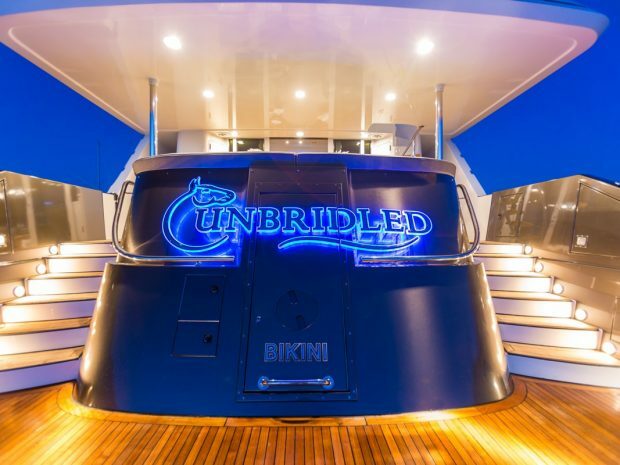 UNBRIDLED’s chic, the uber-cool decor is well suited for young professionals or families. 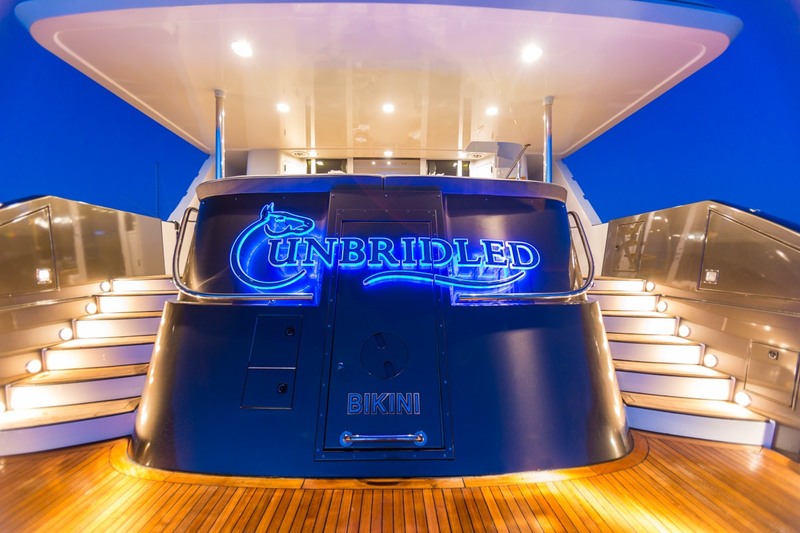 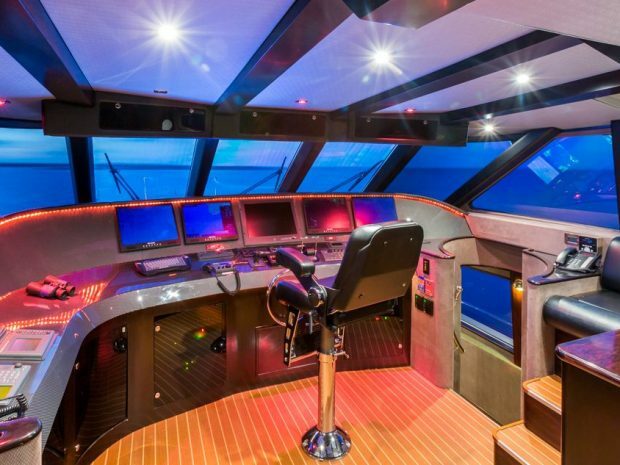 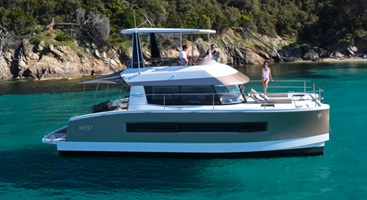 UNBRIDLED offers all new soft goods and her tech-savvy audio/visual assets on board are controlled by iPads. 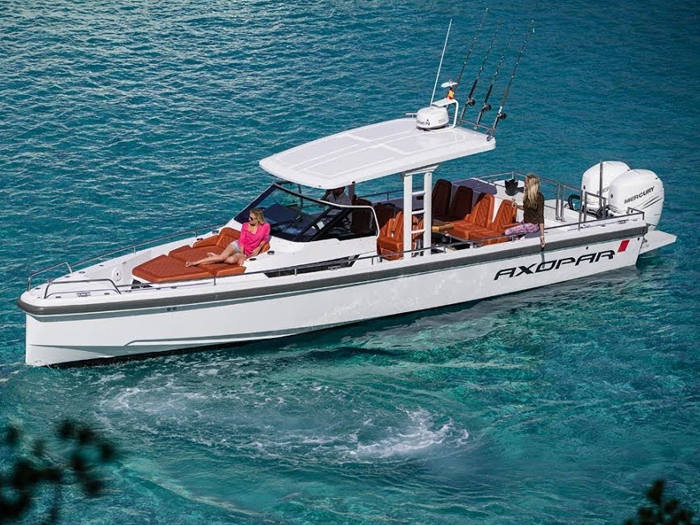 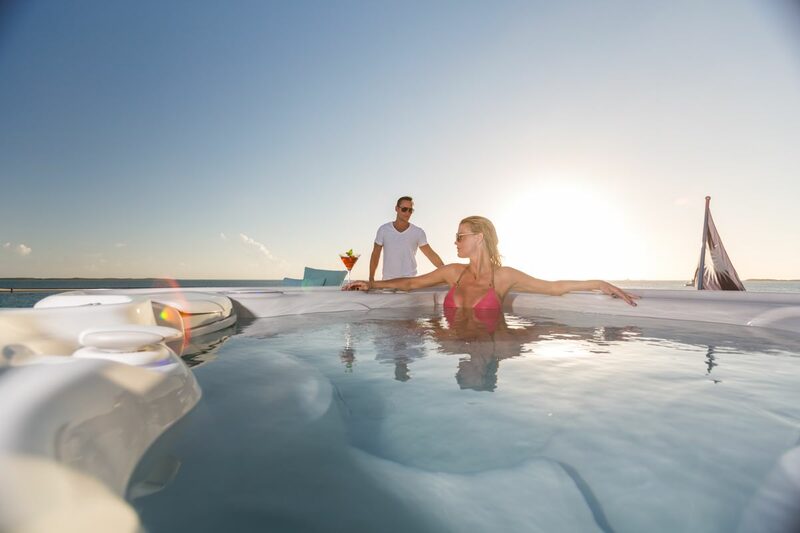 Relax in the brand new Jacuzzi on the sundeck and take out UNBRIDLEDs 26-foot Chris Craft tender for a cruise. 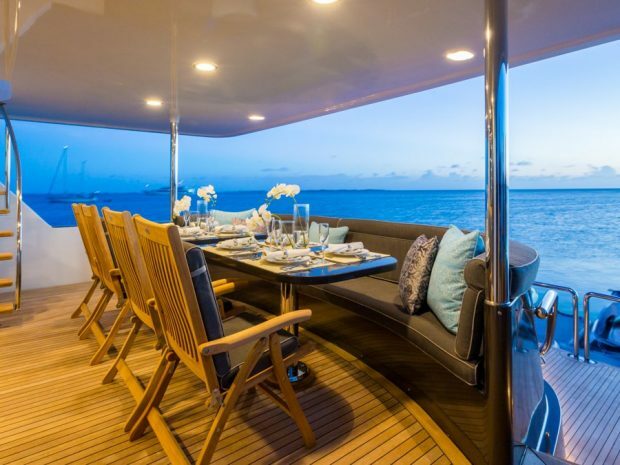 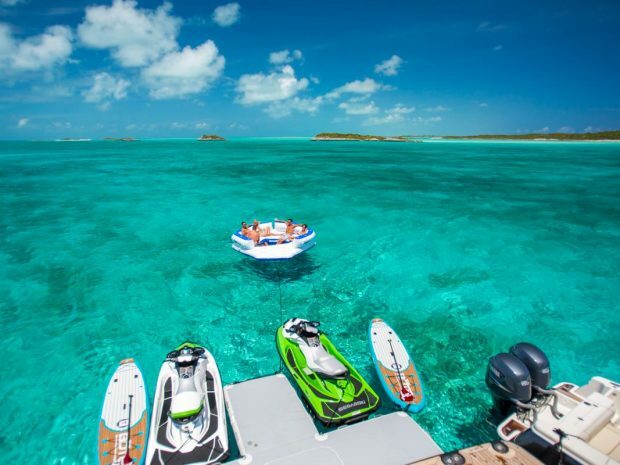 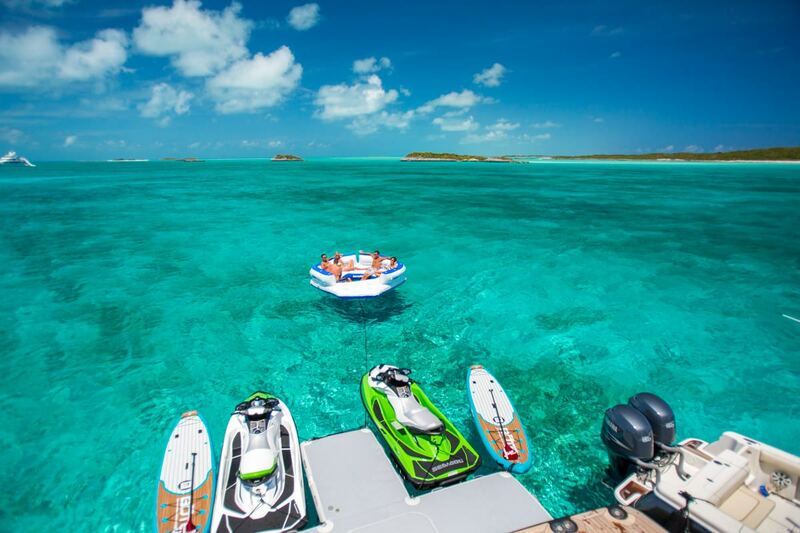 Best of all, UNBRIDLED has a not-notch, professional, young and energetic captain and crew who are eager and ready to give guests the ultimate charter experience. 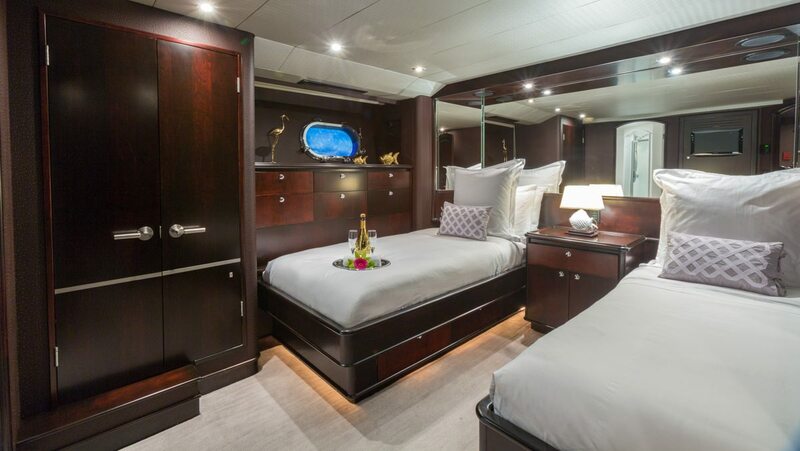 Master Stateroom: Located below deck amidships, accessed via the guest foyer. 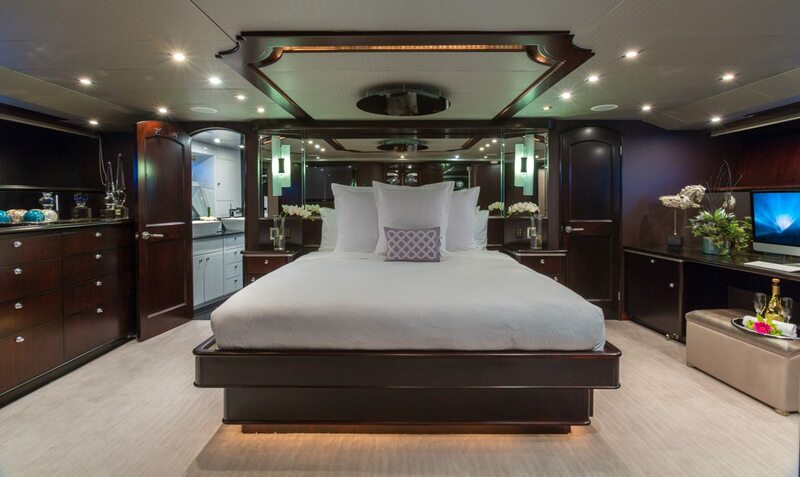 Full-beam with King bed. 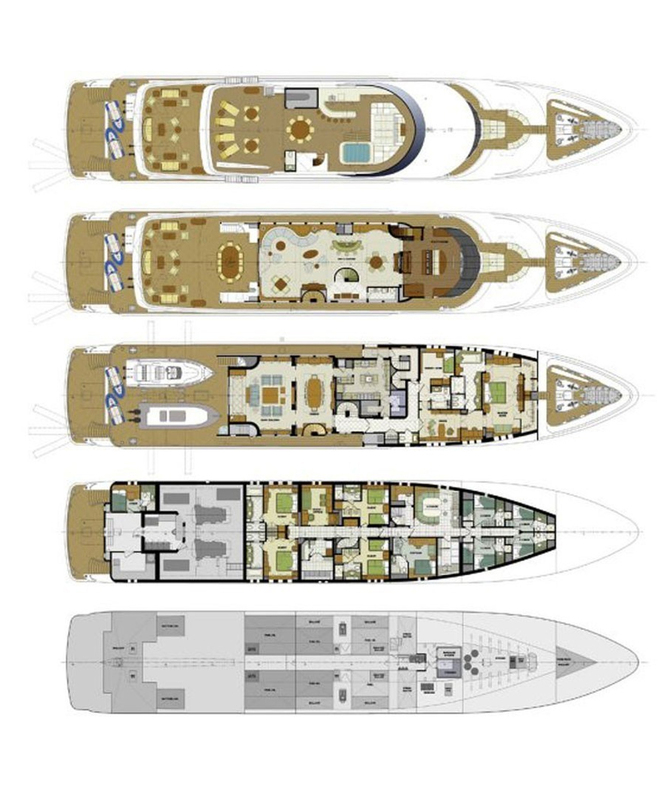 His and her closets. 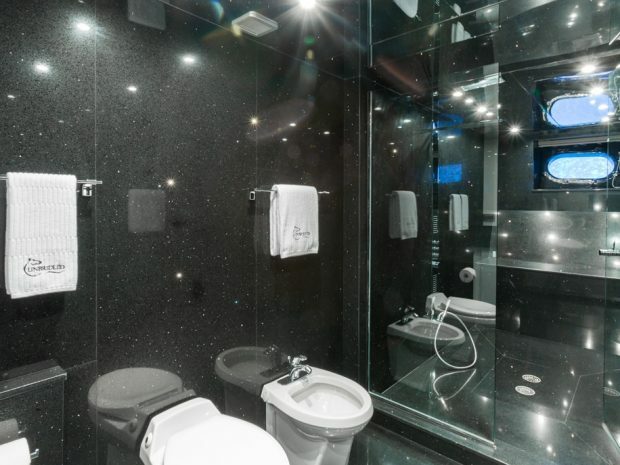 Full beam bathroom with bidet and large walk-in shower. 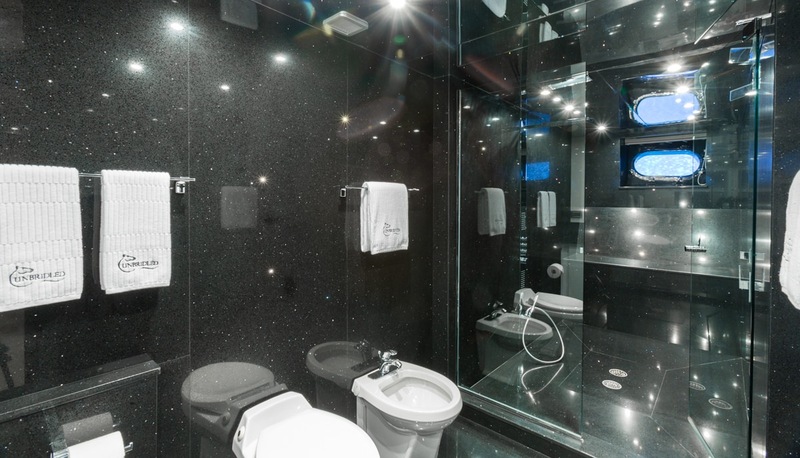 The shower has two large shower heads, one is a rainfall and one is a waterfall. 50″ Panasonic flat screen TV/Apple TV. 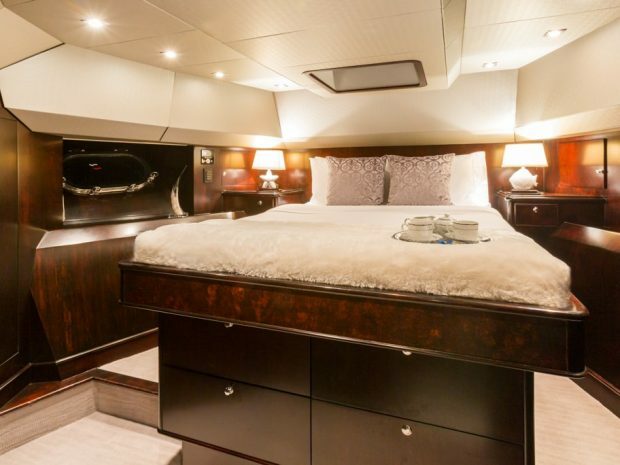 Includes a minibar and wine fridge. 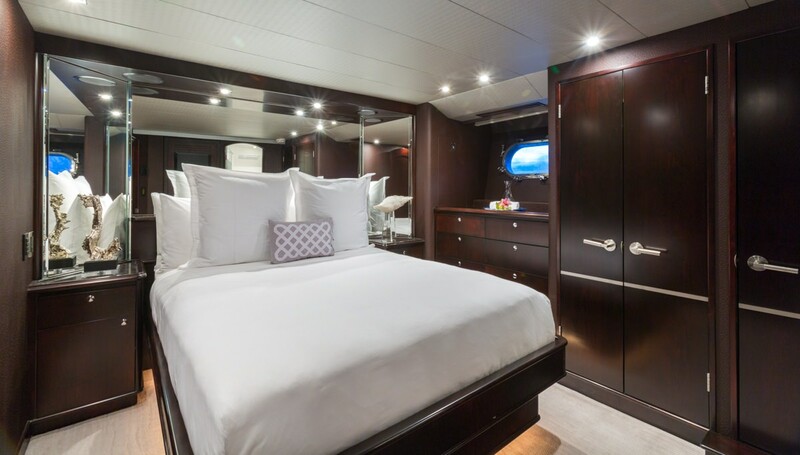 All guest accommodations have Crestron with iPad controls, digital climate controls, and Apple TVs. 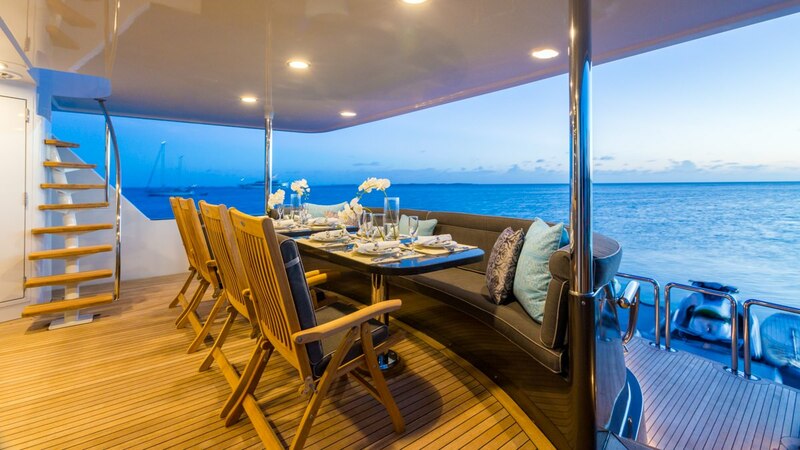 Aft Deck: New Quartz stone table dining table with settee and chair seating for up to 12 guests. 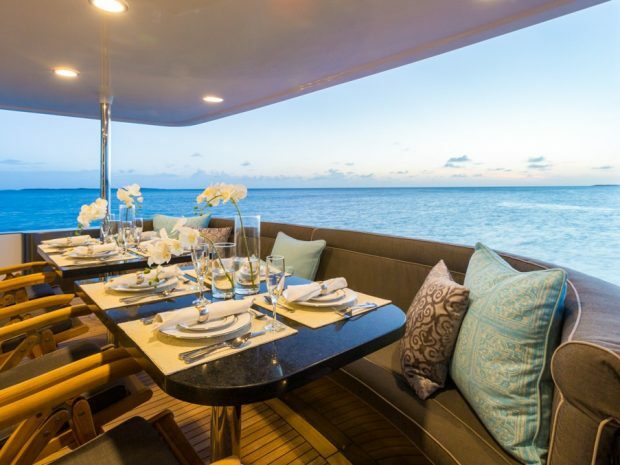 Converts to a 4′ x 10′ dining area. 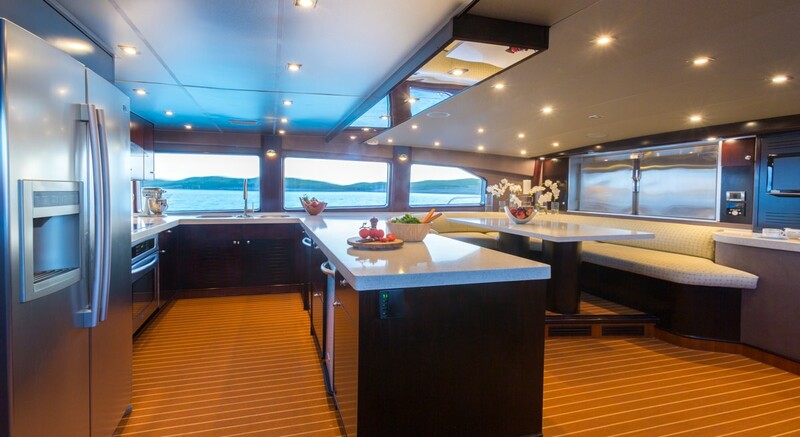 A spiral staircase leads to the sundeck. 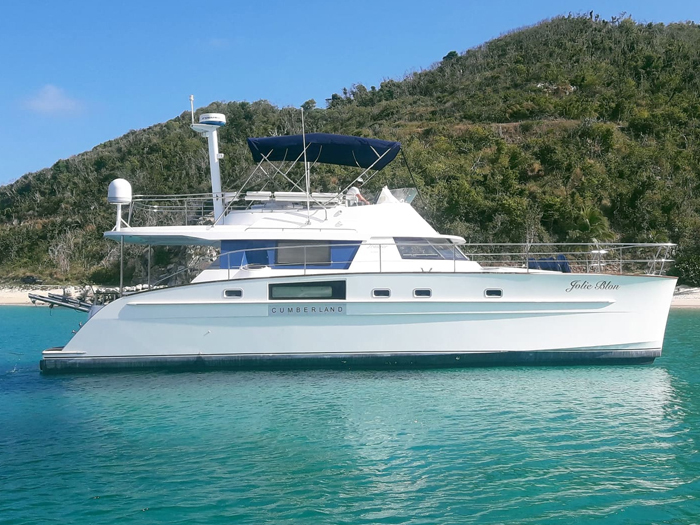 Access to the large teak swim platform that offers lots of room for watersports set-up, with shower and ladder. 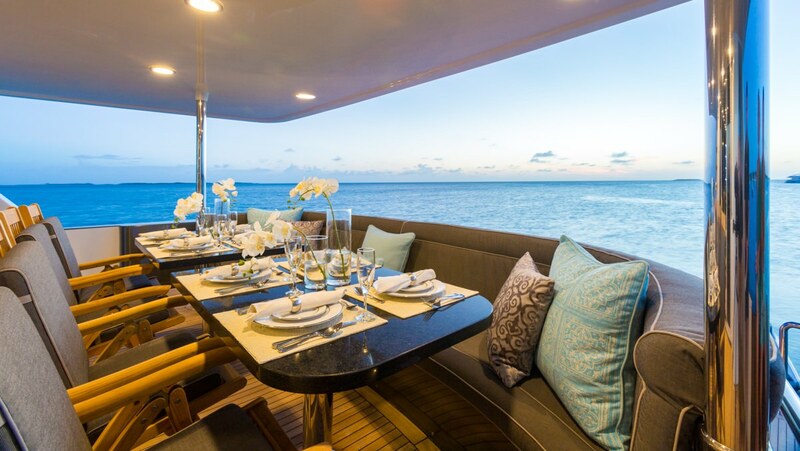 Main Salon: Open, airy and light with large windows, the main salon is accessed from the aft deck via double sliding doors. 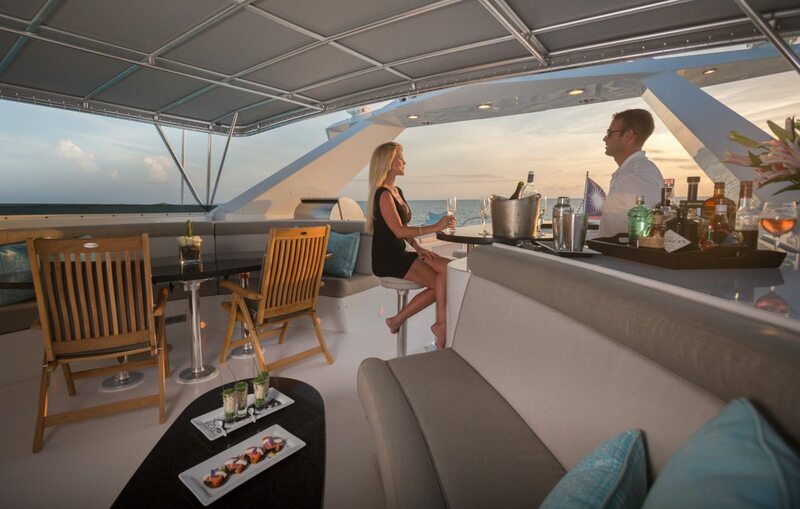 Divided into two main areas with couch seating and wet bar aft, there is a U-shaped couch with 60″ Pioneer Elite flat screen TV forward. 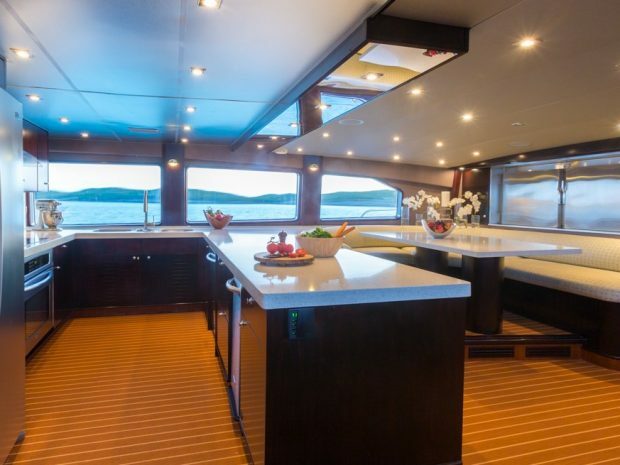 Galley: “Country kitchen”-style with large windows and u-shaped dinette. 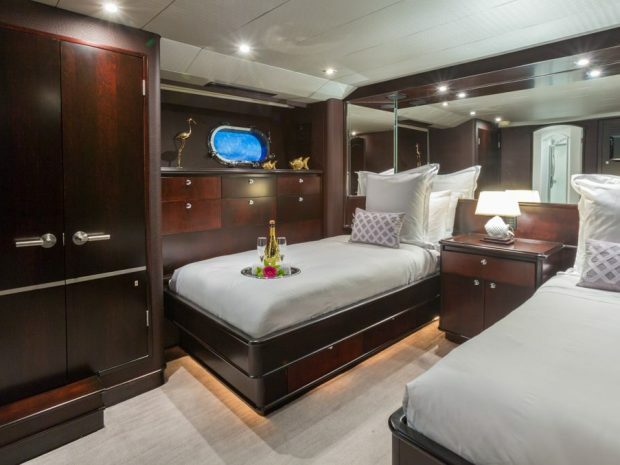 Access forward to Queen guest stateroom below deck. 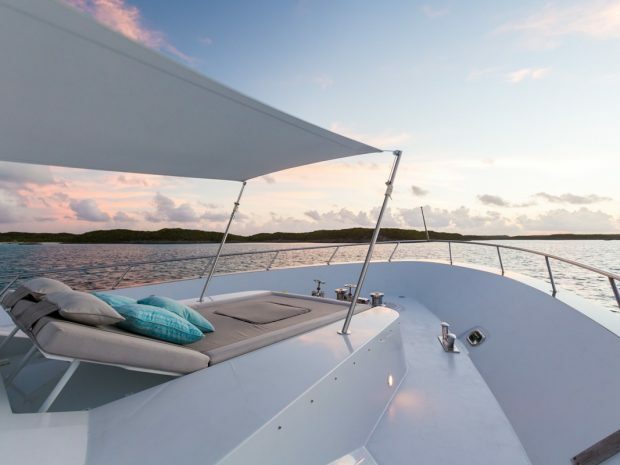 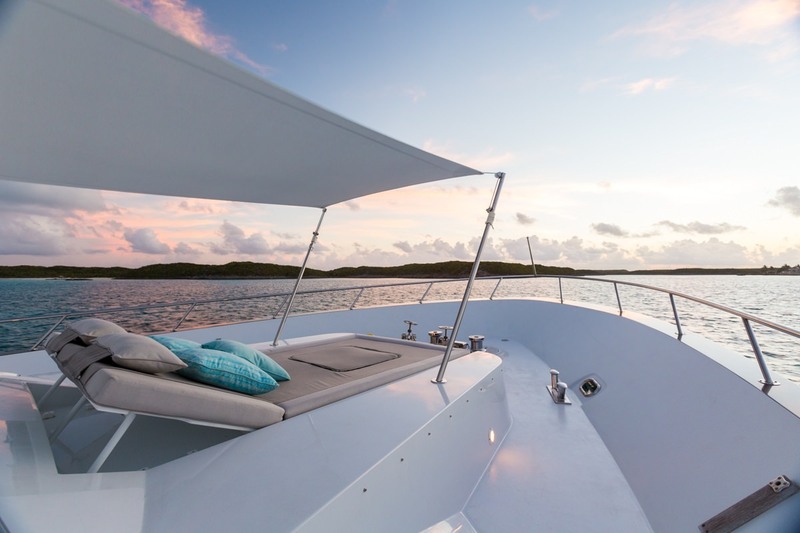 Sunpad seating on the bow with a new bimini top for optional shading. 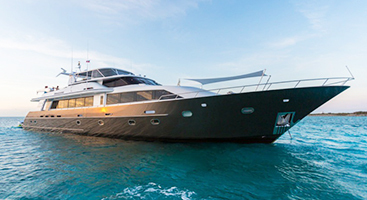 Jason has earned many qualifications in his career. 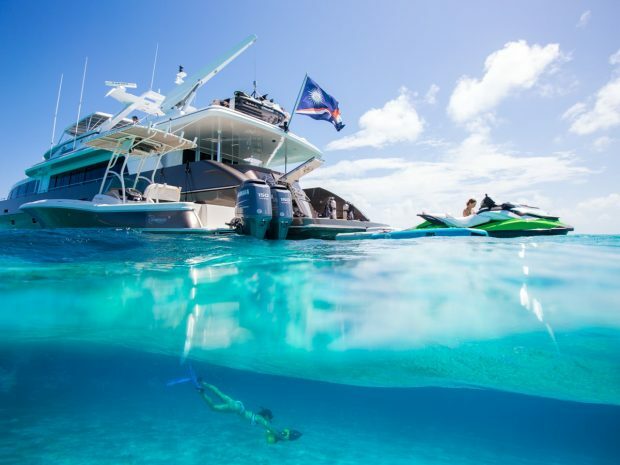 He is a Dive Master and Commercial Diver Class II and looks forward to taking clients out scuba diving in the best areas as well as some secret locations for seeing amazing underwater life. 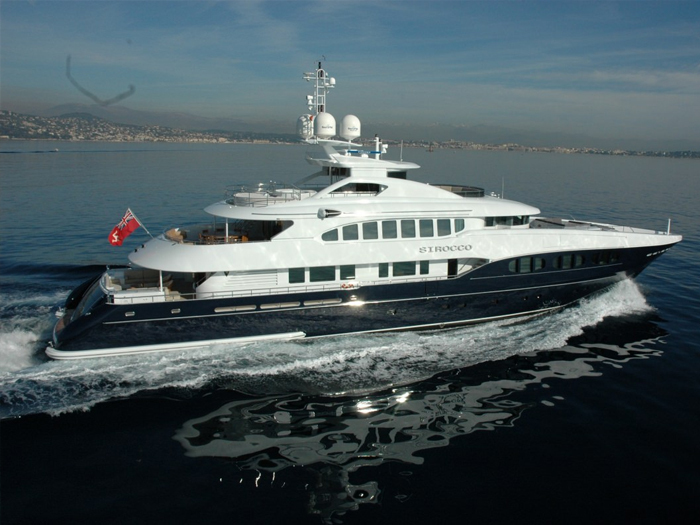 He is a Master of Yachts 200 tons in addition to being qualified in O.O.W. 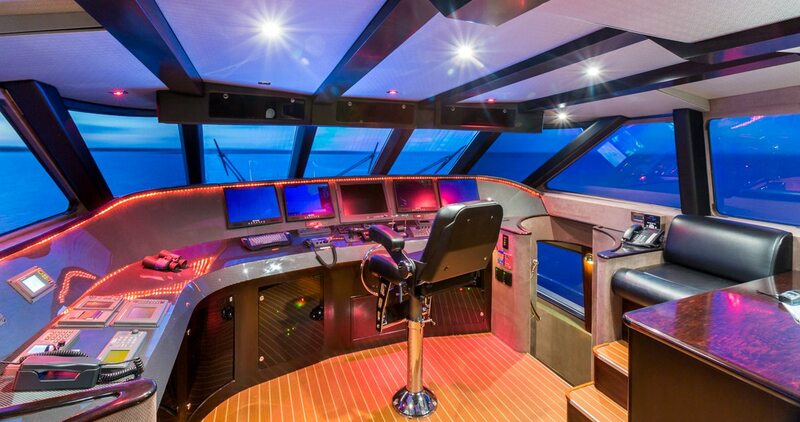 all modules complete and ECDIS (Electronic Chart Display and Information System). 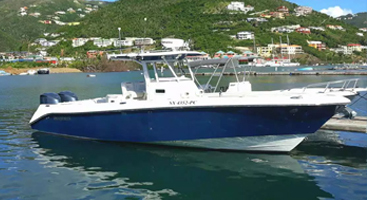 Having taken engineering courses at Rolls Royce Kamewa in water jets propulsion at Kristinehamn Sweden in as well as MAN diesel engineering courses in Houston, Texas, he is qualified for managing yachting systems and handling any emergencies that may arise.